*on buyback* Metro Pacific Investments Corp.
Metro Pacific Investments Corporation (MPI) was incorporated on March 20, 2006 as a holding company for investments in real estate and infrastructure projects. MPI is 55.6%-owned by Metro Pacific Holdings, Inc.
MPI holds interests in water and sewerage utility company, Maynilad through DMCI-MPI Water Company; toll roads through Metro Pacific Tollways Corporation and its subsidiaries, Manila North Tollways Corporation and Tollways Management Corporation; hospitals through Manila Doctors, Inc. and Davao Doctors Hospital, Inc.; and real estate through Landco Pacific Corporation and Metro Pacific Corporation. In 2009, MPI acquired a total of 163.60 million common shares in Manila Electric Company (Meralco) equivalent to 14.67% of shareholdings. Subsequently on March 1, 2010, PLDT Energy Ventures, Inc., formerly, Pilipino Telephone Corporation (Piltel), MPI and Rightlight Holdings, Inc. (Rightlight) entered into an ominbus agreement. The agreement states that Rightlight would be renamed Beacon Electric Asset Holdings, Inc. and would serve as a special purpose company with the sole purpose of consolidating the respective ownership interests of Piltel and MPI in Meralco. METRO PACIFIC Investments Corp. (MPIC) is looking at hiking its budget for an expressway by roughly 25% as it may have to bear costs to secure right of way, an item that government had earlier promised to shoulder. "We have to be flexible ... The project cost may move up to approximately P34 billion," Chairman Manuel V. Pangilinan said after the firm’s annual stockholders meeting on Friday, referring to the 13.5-kilometer connector road that runs from Tondo in Manila to Buendia in Makati. The project had earlier been estimated to cost the firm P27 billion while the government was supposed to put out P7 billion for right of way acquisitions according to earlier reports. It was not immediately clear whether the government was indeed pulling out its share in the project. Department of Public Works and Highways officials could not be immediately reached to comment. Mr. Pangilinan warned, however, that it will have to recoup the additional cost by charging higher usage fees from motorists. "What we’re asking is that they have to be flexible on the tariffs because [the right of way acquisitions] adds to the cost of the project," Mr. Pangilinan said. SEC approval of increase in authorized capital stock; issuance of shares to Metro Pacific Holdings, Inc. The Securities and Exchange Commission (“SEC”) approved on 31 May 2011 the increase in the authorized capital stock of Metro Pacific Investments Corporation (“MPI”) from Twenty Four Billion Two Hundred Thirty Eight Million Five Hundred Eighteen Thousand Three Hundred Thirty Six Pesos (P24,238,518,336.00), divided into Twenty Two Billion Six Hundred Eighty Eight Million Five Hundred Eighteen Thousand Three Hundred Thirty-Six (22,688,518,336) common shares with a par value of One Peso (P1.00) per share, Five Billion (5,000,000,000) Class A Preferred Shares with a par value of One Centavo (P0.01) per share and One Billion Five Hundred Million (1,500,000,000) Class B Preferred Shares with a par value of One Peso (P1.00) per share, to Thirty Billion Fifty Million Pesos (P30,050,000,000.00), divided into Twenty Eight Billion Five Hundred Million (28,500,000,000) common shares with a par value of One Peso (P1.00) per share, Five Billion (5,000,000,000) Class A Preferred Shares with a par value of One Centavo (P0.01) per share and One Billion Five Hundred Million (1,500,000,000) Class B Preferred Shares with a par value of One Peso (P1.00) per share. In connection with such SEC approval, MPI likewise issued to Metro Pacific Holdings, Inc. (“MPHI”) a total of Two Billion Thirty Million Seven Hundred Sixty Nine Thousand Two Hundred Thirty (2,030,769,230) common shares out of the increase in MPI’s authorized capital stock. These shares are issued to MPHI as a result of the conversion by MPHI of the Php6.6 Billion Convertible Bonds issued by MPI to MPHI on 30 March 2010.
galing ng caymans no? kaya pala tindi ng selling nila dati kasi 3.25 lang cost. now it has been told. let the fun begins. 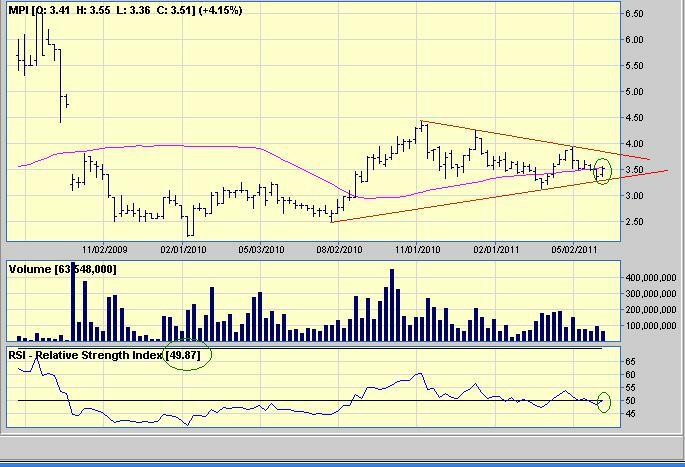 need to close 3.52 for the week for reversal and buy signal confirmation.triangle watch. big upside on the breakout. heartaches for the breakdown. for the time being, its favoring the bulls. kumander ollie, sarap gawan ng storya mpi entitled "the cayman connections". pd cut n paste tp mpi thread with link dito at sa blog ko? Flashback: Last March 21, 2001. Block sale of 68M shares at 3.21 was executed. 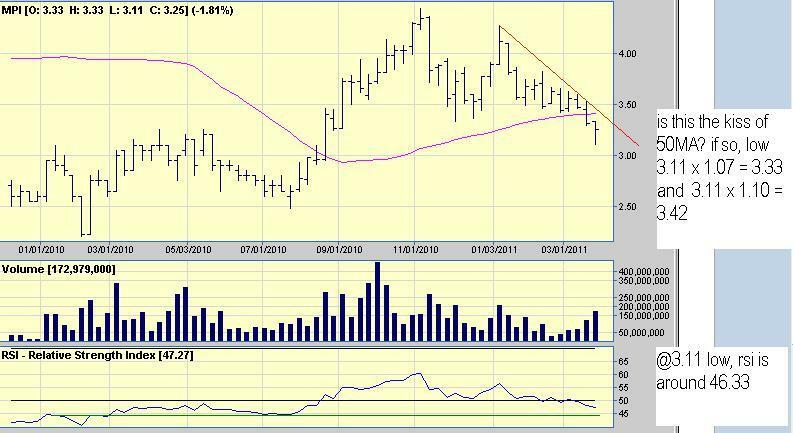 On March 24, 2001 MPI registered an intraday low of 3.11. 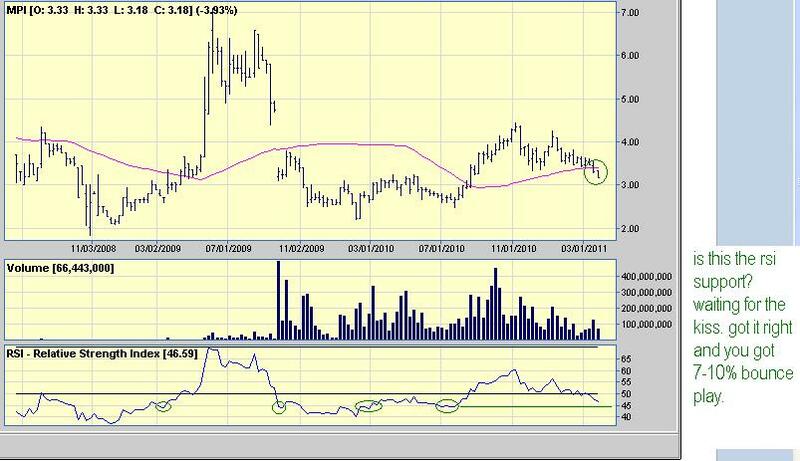 It surge 27% to an intraday high of 3.95 last April 25, 2011. Then again, heavy selling of what i suspect are caymans, send the stock back to 3.37 last May 27, 2011. 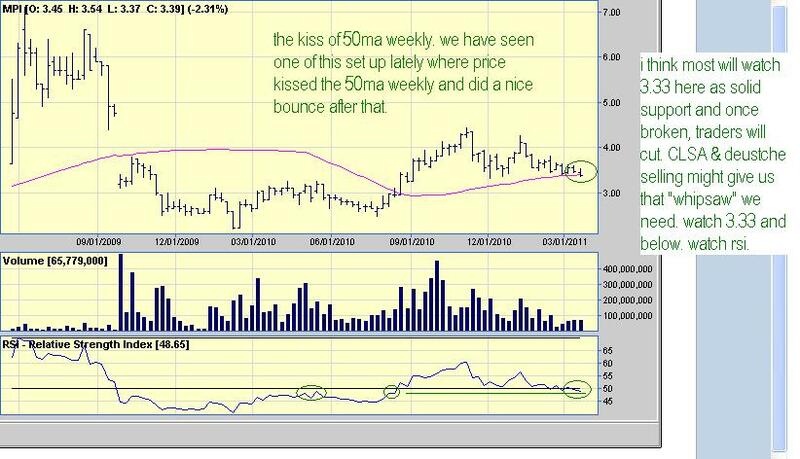 The kiss of 50MA Weekly was first published last March 17 and a follow thru update last March 22, 2011. On March 28, 2011. The low of 3.11 was tag as based for the bounce play. My Reaction: <em>Kaya pala, hanep ah</em> . Personal Note: The caymans are done selling. There's a cayman connection with AGI too but its too time consuming. Just follow the cayman trail and disclosures. These are all broker's analysis. Caveat.